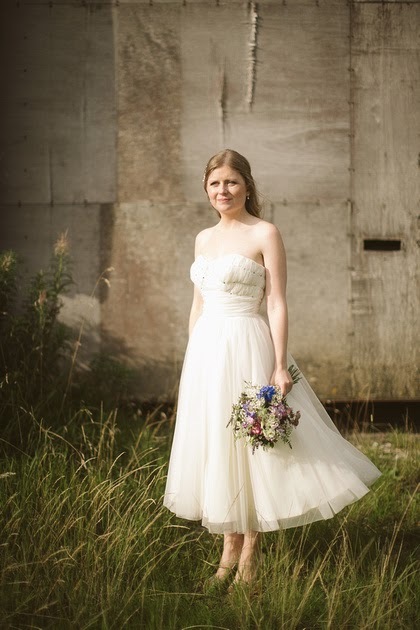 So today I get to do one of my favourite tasks here at Campbell's Flowers and that's write about a real wedding! The one we are bringing you today is that of Rachel and Steven who got married this time last year at East Riddlesden Hall for the ceremony then onto Newton Grange for the reception. It was such a relaxed atmosphere full of hay bales, teepee's and bunting. The bride and groom came and collected her flowers from us here at Campbell's HQ which is quite a popular choice with brides who are DIYing their table decorations. Rachel is a graphic designer from London, (we get lots of fab enquiries from London these days as they tend to love our style and the amount of detail that we put into everything - which is a huge compliment to us). Rachel wanted a very loose and open looking hand tied full of small delicate flowers in pinks, purples, blues and creams. As far as possible we used British grown flowers which was very important to them and so suited us down the the ground - it's whatowe love to do! The florals included Astrantia Roma, Yorkshire Lavender, Waxflower, Larkspur, Stocks, Delphinium, Gypsophelia, Aster and pink Lisianthus all finished off with a band of string. Yep you guessed it, it's that time again, it's feature flower time! This month we have chosen the sunny sunflower. This happy little flower has become quite popular this year and we are predicting it will continue to remain a favourite coming into next summer too. 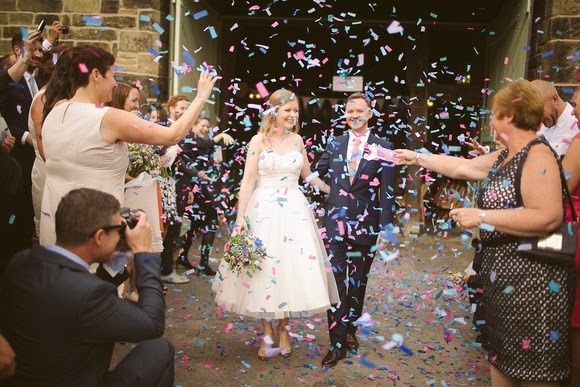 As you'll know by now, all of us at Team Campbell's love looking after you the best way we can, so as soon as you book with us, as a little extra inspiration for you and your wedding day, we make you a Pinterest board and even get it started for you with ideas based on your theme (if you have one) and flowers. We love finding you just the right colours, styles, shapes and types of flowers so you have a really good idea of what's in our heads! It is then yours to add too as you wish. Just recently, we have been contacted by a few brides now wanting to take advantage of this but not quite sure how it works or how to use it, so this is where this blog comes in. If I do my job right, this blog will give you a better idea of how to get started with your boards so you can pin away to your hearts content. And believe me, once you start, you'll find it strangely addictive! 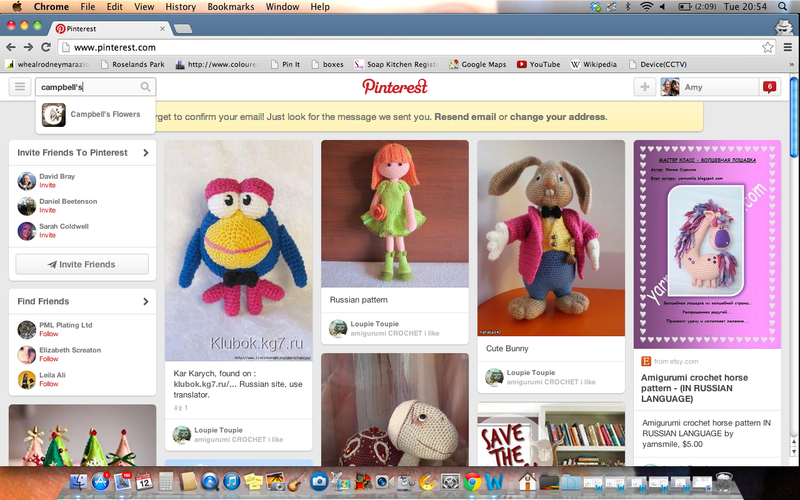 This may seem obvious but the first thing that you need to do is sign up to Pinterest and create an account. If you type Campbell's Flowers into the little search bar in the top left we should pop up below and you will be able to click on us which will take you to our Pinterest page (this is my Pinterest so please excuse all the crochet - it's a hobby of mine). When you get to our page just click follow. 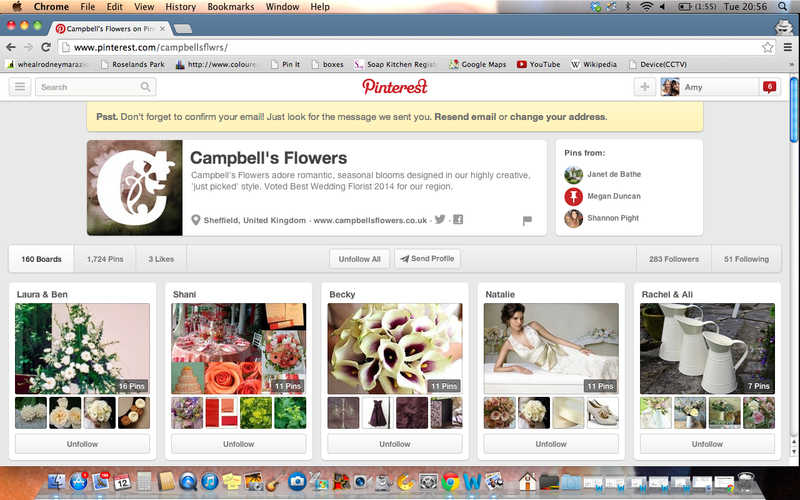 As you can see below I already follow Campbell's flowers but all you would have to click on is follow all. Then just scroll down and find your board. When I create a board I then have to invite you to pin onto the board. This all seems pretty straight forward I know, however, the problem that I tend to come across when doing this is that some of you may use a different name on Pinteres, or might have called your Pinterest account something different like 'Wedding Inspiration' so I have trouble finding you to invite you to pin to the board. I can type your e-mail address in and I can see there is an account linked to that address but I can't find you. If you go onto our Pinterest page and see your board but can't pin or haven't received an invite to do so then the best thing to do is contact me with your Pinterest name and I can invite you ASAP so you can get started. There are plenty of ways to get in touch with me the main one being my e-mail address which is amy.campbellsflowers@gmail.com. Here is a list including the many other ways you can get in touch , facebook, twitter, pinterest, YouTube. There is also an option to comment on this blog, so no excuses if you are unsure get in touch and do let me know how you get on too! I really hope this helps, but as I say, any problems - just email me. 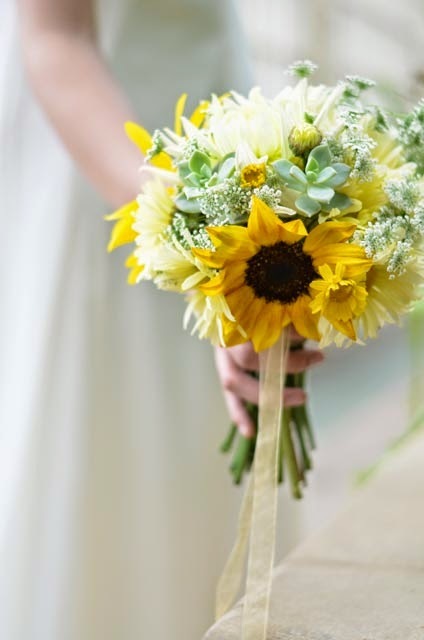 The phone has been red hot here at HQ as we've had a lot of husbands get in touch recently regarding bouquets for their beautiful wives one year on from their big day. So I thought I would put together a quick blog for all of you out there looking for some inspiration for your first anniversary celebrations.